We manufacture Anti vibration mounts as per customer drawing and specifications. Anti-Vibration Mounts (AVM) offered find application in isolating all machinery and equipment from possibility of vibration as well as other floor motions. Featuring durable and consistent design standards, these are developed to perfectly absorb the generated vibration from the machines. Further, these are also resistant to oil and find application in end products like air-compressors, generators and others. We can also design the product as per customer’s requirements. 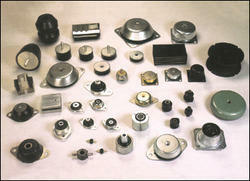 We are the leading supplier of Anti vibration mounts made available to our clients at competitive prices.